Icons portray what we believe. Orthodox Christians venerate (not worship) icons by standing before them, making the sign of the cross and kissing them as a gesture of pious respect. In the front of the Church there is a large icon screen called The Iconostas. It stands between the nave and altar of the sanctuary and contains the principle persons of our faith. The doors in the center, called The Royal Doors, include the four Apostles, Matthew, Mark, Luke and John. 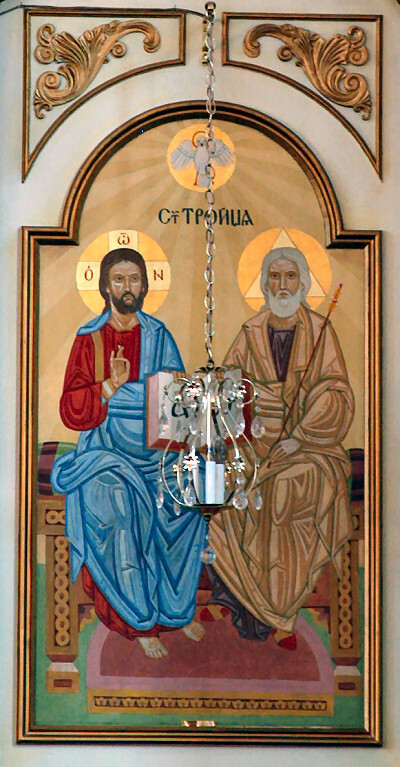 The Icon of Christ the Lord always appears in the first panel to the right as you face the iconostas. The Icon of Mother of God (Virgin Mary), also called The Theotokos (Birth-Giver of God), always appears first to the left.She is honored first among saints by Orthodox as the mother of the Savior. It portrays the Theotokos (Birth-Giver of God), holding the child Jesus in her bosom. This prominently displayed icon emphasizes the incarnation, God becoming a man through a woman and the Holy Spirit. It does not intend to extol the Virgin Mary alone. To the right of Christ is the Icon of Saint Michael. To the left of the Icon of the Mother of God is Saint Stephen. To the right of the Icon of Saint Michael is the Icon of the Holy Trinity, for which our Cathedral is named. 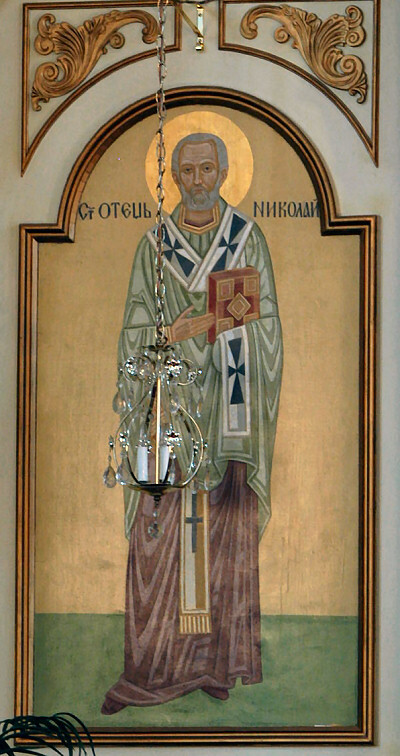 To the left of the Icon of Saint Stephen is the Icon of Saint Nicholas. The Icons on the top of the Iconostas depict the twelve Apostoles, and the centre Icon is of the Last Supper. An overview of Orthodox belief and practice. Written in an easy to read style that is perfect for those just starting to study the Faith. Known throughout the world as the best contemporary survey of Orthodox Christian history, faith and life. A “must-have” for anyone seeking to learn more about Orthodox Christianity.